A) Beach Yoga with Mary from 8:30- 9:30 on Tuesday & Fridays ~ meet at the entrance to beach across from Sunset Park @ Ocean Blvd & Ocean Drive. Check out Mary's facebook page Yoga Loca! B) Yoga with Danelle on Sundays 9:30am -10:30am! Join Danell Sunday for an uplifting Yoga Class. Everyone Welcome- Bring Family & Friends - Every level. Bring a sheet or beach towel for your practice. A) Bird Rock Yoga has a variety of outdoor classes. They do a summer full moon series and other events. This year they have a Thanksgiving day class at 10:30 am! The Mon, tues, thurs beach yoga classes start up again in March 2018. B)Join Steve for an oceanfront yoga practice every T, TH, Sat, Sun at the end of Law St. This is a Power Vinyasa Class! You can check out Steve's Site NamaSteve Yoga for more details. Please Be aware that the city has capped these classes. Arrive early in order to get a space. Come join Brad at 10:30 am-Noon every Saturday & Sunday. Check out his facebook page for location & updates on additional beach classes and sunset classes. Outdoor classes in Encinitas! Way too may to put here! A)Tuesday Thursday beach yoga at 5:30 pm Sunday at 9am @ Marcinski Beach with Kula Yoga! More info here! B) Saturday morning 9-10 am beach class is located at Marcinski beach, (which is located one block north of the Juno pier, children practice free:). Suggested donation of $10.Check out more info on this class here. D) Saturday 8-9 am Jupiter Beach, Marcinski Rd & A1A. Look for beach access #25, head down to the beach and look for the Tibetan prayer flag. Suggested Donation of $10. If weather is questionable please call or text 561-214-5326. She also hold a Saturday class at Busch Wildlife Sanctuary in Jupiter with proceeds ($15) Donated to the Sanctuary. You can also find out more about Stacy's classes here. A) Wednesday at 9am, Saturday at 8am & Sunday has 2 classes one starting at 7 am the other at 9 am. Class is held at Lake Worth Beach in Lake Worth, FL. (North of Pier in Kruesler Park) on the sand left of lifeguard tower. Check out Kerri's facebook page for more info on Kerri's classes. Classes EVERYDAY in Miami on the beach!! Check out 3rd Street Beach Yoga for more info! Check out Beach Yoga Pinellas for a huge listing of outdoor beach and SUP yoga classes on Florida's South Western Coast! You're bound to find one that fits your needs! Check out Starfish Yoga for more information on Beach yoga on the Gulf Coast! Mexico Beach Yoga has a variety of class styles, dates and times to choose from, coming to you from the Gulf Coast! 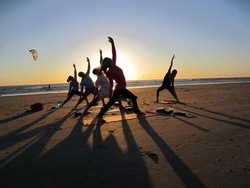 Lovinglight Yoga holds beach classes on a regular basis on the gulf coast of Florida. Monday & Wednesday 6:30 pm. Everyday at 9 am! Scenic Yoga does its best to keep information up to date but that is not always possible so please contact the class directly for additional assurance and information on class times and locations. Many classes are offered free of charge/suggested donation. Please keep in mind the exchange of money is an exchange of energy. Give what you can, and if you ARE truly not able to give a monetary amount remember a genuine 'Thank You' goes a very long way. Last updated 11/2017.